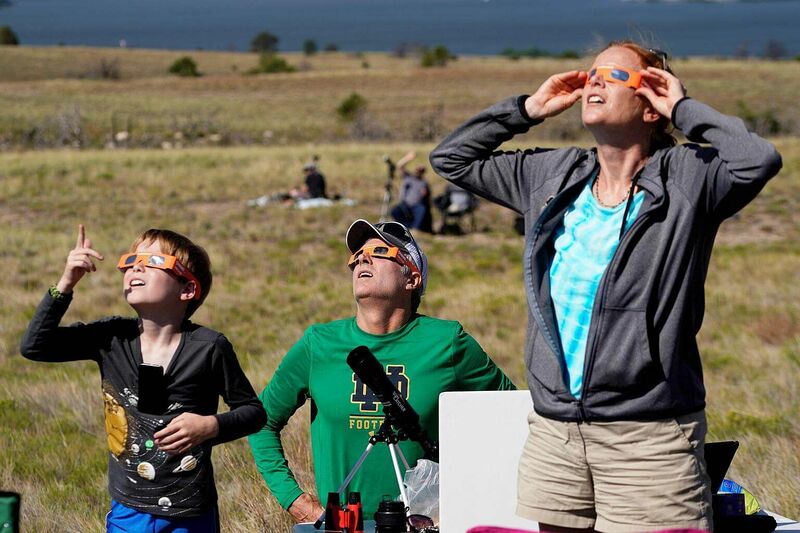 SHERIDAN, Oregon/SALMON, Idaho (REUTERS) - Millions of Americans equipped with protective glasses took up prime positions on Monday (Aug 21) along a ribbon of land across the United States to marvel as the first coast-to-coast total solar eclipse in nearly a century began to unfold in Oregon. After weeks of anticipation, the sight of the moon's silhouette passing directly in front of the sun, blotting out all but a halo-like solar corona, will draw one of the largest audiences in human history, experts say, when those watching via social and broadcast media are included. Some 12 million people live in the 113-km-wide, 4,000-km-long zone where the total eclipse will appear on Monday, while hordes of others have travelled to spots along the route to bask in its full glory. At Roshambo ArtFarm in Sheridan, Oregon, people aimed their cameras at the sky a few minutes before 10 am, as the moon slowly ate into the sun. Matt Johnston, 42, a self-described space geek, said he arranged for his family's annual camping trip to coincide with the eclipse, driving to Oregon from Yosemite National Park in California. "The show is going to be in the sky," said Johnston, who has seen partial eclipses in the past. "You're supposed to be able to see the stars." The eclipse was to first reach totality in Oregon at 12:15 am Tuesday Singapore time (1715 GMT) and was to march slowly eastward across the country. 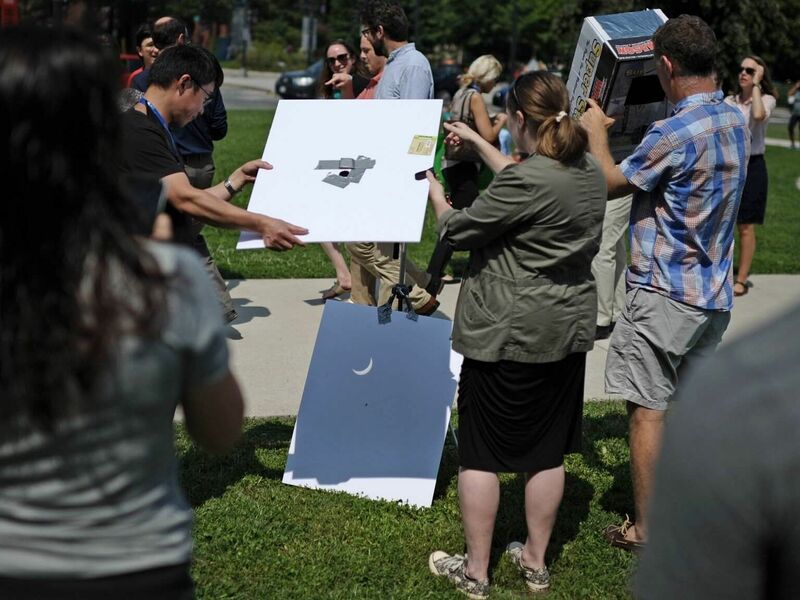 Some 94 minutes later, the phenomenon will take its final bow at 2:49 am Singapore time Tuesday (1849 GMT) near Charleston, South Carolina, where eclipse gazers on Monday morning were gathering atop the harbour's sea wall. Officials said Charleston County's 16,000 hotel rooms were booked and police expected up to 100,000 visitors to the area. Nancy Conway, 57, an elementary school principal, said she made the long drive from Lynn, Massachusetts, with a car full of relatives. "Twenty hours, three drivers, four adults, two 6-year-old twins," Conway said as she sat in a lawn chair facing the harbour. "It's a once-in-a-lifetime experience." A number of towns within the total eclipse's path set up viewing parties. At the Southern Illinois University campus in Carbondale, Illinois, the 15,000-seat football stadium was sold out for Monday. "I woke up at 4 am so I'm excited," said Madeline Rubin, 17, who drove two hours to the stadium with others wearing T-shirts that said "I totally blacked out." The last time such a spectacle unfolded from the Pacific to the Atlantic was in 1918. The last total eclipse seen anywhere in the United States took place in 1979. For millions of others outside the zone of "totality," a partial eclipse of the sun will appear throughout North America if there is no local cloud cover, a spectacle that was expected to draw its own crowds. 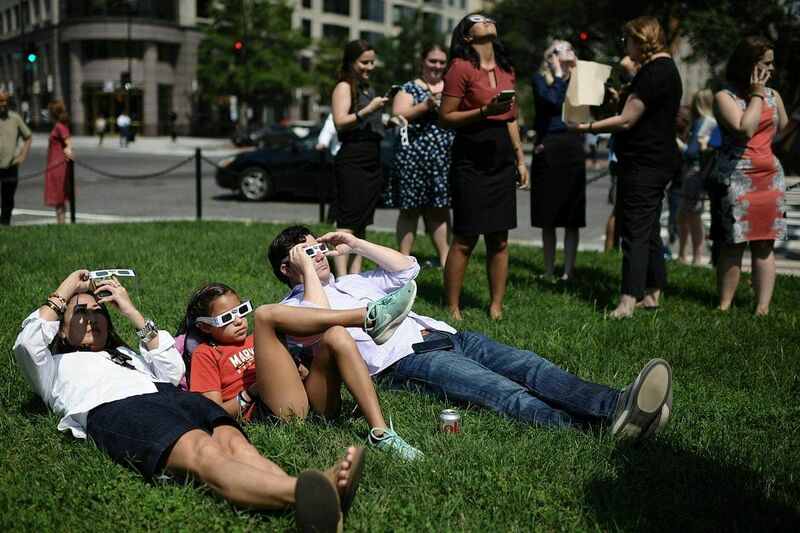 In Washington, DC, hundreds of people waited in long lines outside the National Air and Space Museum, which was distributing more than 20,000 pairs of free viewing glasses. Residents of the nation's capital will see 81 per cent of the sun obscured at the eclipse's peak. Daniel Berger, 33, a software developer from New York, said he has been waiting with his wife and their two children for almost an hour. "This is a far larger crowd than I anticipated," he said. "It's the first non-political attraction for D.C. in many years, so that's nice." Perhaps never before have so many people had the opportunity to see a total eclipse, said cartographer Michael Zeiler, who maintains the www. greatamericaneclipse.com website and a self-described "eclipse chaser" who on Monday will mark his ninth time seeing "totality." Weeks of publicity have fanned excitement, he said, and may have persuaded many families to make last-minute road trip plans. Zeiler estimates that up to 7.4 million people travelled to the zone to observe the total eclipse, which takes place in the peak vacation month of August. Many people have trekked to remote national forests and parks of Oregon, Idaho and Wyoming. Those who live along the path, which cuts through a few population centres like Kansas City, Missouri, and Nashville, Tennessee, can simply walk out their homes and look skyward. For those who live too far from the shadow's path or cannot escape the indoors, a NASA-linked website, eclipse.stream.live, and a companion mobile app will provide a live stream filmed from the vantage point of 50 helium-filled balloons at a height of 24,384 meters. The sun's disappearing act is just part of the show. As the black orb of the moon nibbles away at the sun's face, the heavens dim to a quasi-twilight and some stars and planets will be visible. The last glimmer of sun gives way to a momentary sparkle known as the "diamond ring" effect just before the sun slips completely behind the moon, leaving only the aura of its outer atmosphere, or corona, visible in the darkness. The corona, lasting just two minutes, marks the peak phase of totality and the only stage of the eclipse safe to view with the naked eye.